Honey Lee is probably one of the classiest, loveliest ladies in the Korean entertainment space (those dimples!). 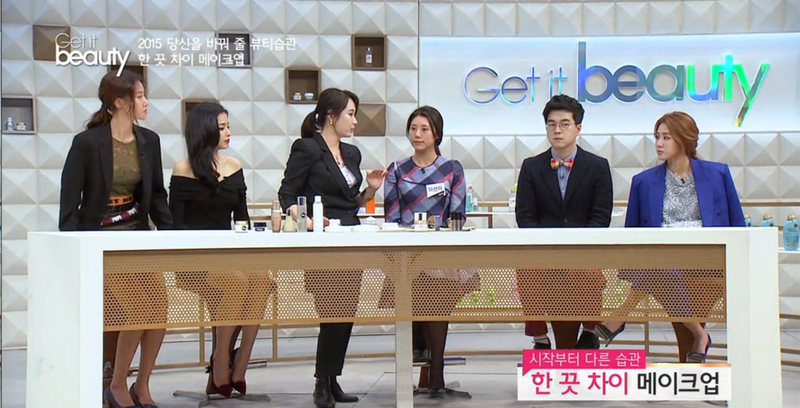 So despite not being a fan of the variety scene, I had to check out this year's season of Get It Beauty, which is essentially a beauty-centered advice show with her as the main host. Although I'm not generally a recapper, I wanted to try my hand at it here, as the topics covered are actually quite interesting for skincare lovers like myself. It won't be exorbitantly detailed, but will instead highlight what I felt were the more interesting tidbits. As a whole, I find this show follows the typical Korean talk show format, featuring a group of hosts with different backgrounds, some on-show challenges and demonstrations, and the occasional bit of gag humor. The hosts include Honey Lee, idol group SISAR's Soyou as the fresh young face, a lady named Kim Jung Min who I'm guessing is a former host, and a surprisingly knowledgeable though quirky guy named Hwang Min Young, who was obviously strung in to inject a necessary bit of self-deprecating humor. I'm not yet taken with any of the supporting hosts, and since I'm really only watching to learn Honey's beauty secrets, I'd almost rather we just had a shorter episode that only focused on her rather than bothering to give screentime to all the ladies (and random man). This show is centered around beauty though, and I was satisfied to find episode 1 informative and light-handed on the jokes. I came away with some valuable knowledge, and for that alone I might just keep watching. Also, who can say no to Honey's request to "watch so you can become prettier"? We're introduced to Honey, who's dressed impeccably in a fitted black, off-the-shoulder dress and burgundy pumps. Her hair and accessories are also of course enviably perfect. She greets the crowd of girls, termed "Better Girls", who serve as the audience / test subjects. Not a bad gig for them I think, especially as they end up with nice samples of the highlighted products at the end. Honey introduces the other hosts, and in short order we're on to event number 1, which is an overview of the products in all three ladies' vanities. According to the makeup expert, you shouldn't refrigerate oils because they can separate and be ruined by the cold. It's best to just store them in a cool place. 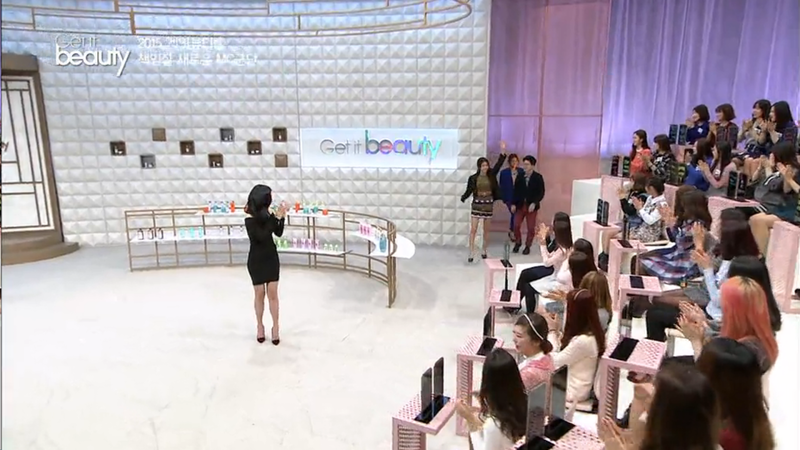 Following this vanity reveal, we move on to a skincare / makeup demonstration by the guest makeup expert to the show. Don't pump mascaras (e.g., pull the stick inside and out) because that can let in air and cause drying. We now get some candid camera shots of the ladies filming their daily routines. Soyou basically films her hotel travel routine, which includes taking a 15 minute bath (no longer or you'll dehydrate) as well as a shot of her skin and haircare products. What's irritating about this show is all the brand names are censored, so you don't know what the products are unless you recognize the packaging. On the plus side, this means we're hopefully getting the ladies' real thoughts, and not just their recited views on the sponsor of the week. I recognized only a Jo Malone body lotion from this line-up on Soyou's vanity. Honey apparently lives out of her van, so she goes through some of her snacks and things. She keeps a humidifier and air purifier in the van to cleanse the air and prevent drying from the heater (this is seriously intense beauty commitment). She also keeps healthy snacks for chomping on if she gets hungry after midnight. Even more impressively, she brings five thermoses of drinks with her everyday - lemon tea, water, pumpkin soup (no idea what this is), coffee, and red bean water / burdock tea (which is for decomposing cholesterol apparently). Wow, and I thought I liked my drink options. I'm curious if the burdock tea actually works, as who wouldn't want lower cholesterol? Jung Min just really rubs me the wrong way. She comes across as very self-absorbed (all that preening for the camera!) and makes too many attempts at being funny that just don't work. Not to mention, I don't find her tips all that helpful. She washes her face with vinegar soap in the morning, followed by a face mousse-type mask. She also shows off her entire refrigerator full of cosmetics - it's pretty much overkill, since there's no way even a family could finish that stuff before expiration, least of all one woman. 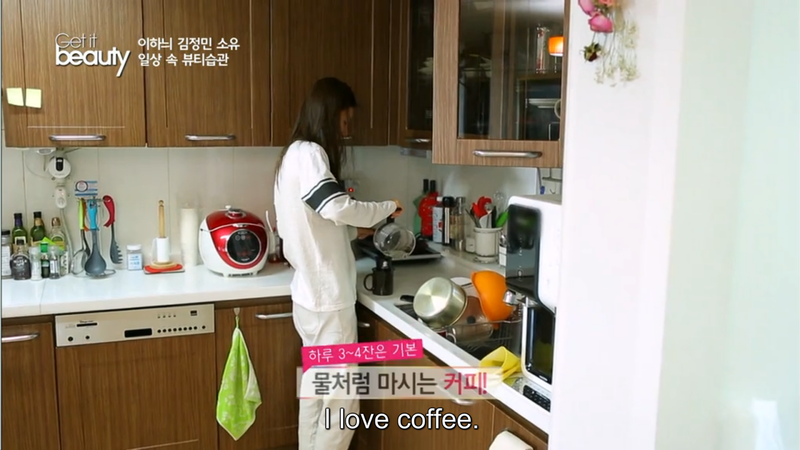 Jung Min is also a coffee addict, citing that she drinks 3-4 cups a day. Our dermatologist guest warns that too much coffee can lead to skin dehydration, and tells people to drink two cups of water for every one cup of coffee (a rule I should also learn to follow). We launch into a quick overview of the ladies' exercise routines. Honey has a personal trainer and focuses on exercises around the core muscles. She mentions that working out after you stretch your muscles helps make them thinner and stronger. Soyou does pilates. Ever unhelpful and histrionic Jung Min basically does something called fascial therapy, and uses this as an excuse to moan and get attention in front of the camera. I skip through the whole fascial trial drama because I don't foresee any valuable insight from this jokey segment. But I get that this was the only way they could give solo male host rep Min Young his screentime for the week. 1. Dr. Jart DermaClear Micro Water - it leaves a "slimy" or "moisturizing" layer after you use, which some girls love and some hate. The ones who love ultimately win out. 3. Bioderma - there's some surprise as to how this only came in third despite being the winner. 4. Belif Cleansing Herb Water - apparently this causes makeup to "peel" from the skin, which Soyou likes but clearly most people think is too harsh. That's it for week 1! All in all, I was pleasantly surprised at how much useful info managed to get embedded in an entertainment segment. Clearly though, you have to be a beauty lover else you'll be bored out of your mind. Honey managed to be as classy as you'd expect, but to be fair she also came across a bit overly formal and distant given her hosting responsibilities. Did anyone else watch this, and if so what were your thoughts? Hello! I actually like this series very much. I don't follow it very closely and miss out on alot of episodes but I like the idea of it. Though I have to say, Get it Beauty is in it's 3rd or 4th season now with Honey Lee? The second season was with Yoo In Ah, which was alright. I really LOVED the first season with Eugene. Out of all 3 hosts so far, she was the best I felt. She's really pretty and sweet, but not in the high-class way that Honey is; Eugene was more down to earth and relatable i felt - not only in terms of her beauty, but her hosting style and personality as well, she's very warm and friendly to guests etc. Yoo In Ah and Honey tend to feel quite unrelatable to me and leave me quite cold. But anyway, I liked the first season too as I felt it had the most relatable beauty tips and tricks. It had tips that the average everyday woman - who is busy with work/family/studies etc could relate to, makeup steps and rituals they could very easily incorporate into their everyday lifestyle. I think that beauty shows need to be able to be relatable to their female viewers in that way. But seasons 2 and 3 usually leave me feeling like the things they suggested were SO unrealistic for the average busy woman. Like for eg, Honey's various drinks she carries around. I mean those are really good. And her beauty products/rituals all sounds great. But honestly, who has the time or effort to keep up with all of that?! So my one huge pet-peeve with regards to the show, and which has put me off all the other seasons is the just the unrealistic tips they give the viewers. Most of the time, nobody has any of the time/effort/money to do any of that. I know I don't. I probably would though, if I were a celebrity, like the hosts are. I'm 100% with you on the impracticality of a lot of these tips (oh to be a celebrity and have a team dedicated to maintaining your beauty!) In fact, that's a lot of why I don't like Jung Min, because seriously, who can possibly own a whole fridge of skincare as well as cartloads of cosmetics in their drawers? Vain AND wasteful, not a great combo in my book. I did find small things like the cotton pad soaking tip to be quite helpful though, and am hoping more useful things will come through in later episodes. At least they're being honest about their routines, and not giving the typical celebrity beauty interview response of "oh I just eat healthy and drink lots of water." I'll have to check out season 1 then! I've never really loved Eugene in any acting projects, but agree that she seems so approachable, and of course looks divine for her age. Thanks for the tip! Oh you brought up another good point! The wastefulness. It is actually one of the main reasons I don't watch beauty shows in general. Like, for every look they recommend, you need like about 10 products to go with it. So like in Korean beauty shows, they like suggesting 'winter makeup' and 'cherry-pink look' for spring or whatever. And every one of these looks has 10 different types of goo to go along. I mean, come on. Who has the money to buy all of that? Not to mention how bad for your skin it really is, to be having so many different type of products applied all the time. I too find such practices to be vain and very wasteful. Being a minimalist and an environment-friendly person, I don't like it. I dislike celebrities who say things like water and good night's rest is all you need to be beautiful (puh-lease). But I actually wish the shows would focus more on things like 1) Better skin care. Not makeup, but skincare. What are the best products for different types of skin. What combinations can one use. What are steps. Are serums really necessary etc. Those things are far more important to beauty than makeup I feel, which in alot of cases too much actually makes one's skin look worse than it really is. 2) how to make use of products efficiently. Eg, the different types of looks i can get out of say a dark brown eyeliner. I like that in Korean makeup rituals, they do sometimes double up blusher for eyeshadow or lipstick for blusher etc, I think they should focus more on that. And it eliminates alot of wastefulness and having to buy a ton of products. 3) I was hoping for a 'Natural' makeup section but I don't think it has ever happened on any of these shows. Alot of makeup has a ton of chemicals which I'm quite sensitive to. And personally, I can't use Korean makeup cause it has such a horrible effect on my skin!! Causes me to break out and have dry flaky skin etc so I can't use whatever they recommend anyway! But yes, i found the cotton pad soaking thing to be very helpful! And yup, I've never liked Eugene in any of her acting stuff, but I really liked her in season 1. I'm kinda waiting for her to come back so I can get interested in it again, but it is never going to happen! Sounds like we share the same philosophy on beauty - the simpler and less wasteful the better! I also hate to think of how many products are probably just thrown out by these celebrities. I know that Go Hyun Jung popularly stated in her book that she throws out all of her products once they hit the 3-month mark. I'm glad that Honey at least seems to be a bit better, assuming it's true that she rotates the products to body use after a year. I'm also much more into skincare than makeup, and in fact don't see why the two should be as separated as they are in the industry. I want makeup products that are good, and certainly not harmful to my skin given how long the product might end up sitting on your face. And yes, Korean brands seem notoriously bad on the chemicals front. My impression of Etude House is that their products are basically toxic, and the same for higher-end brand Laneige and others (you can tell from the very chemically smell and feel of them). The only brand that seemed at least somewhat naturally-derived was Innisfree, which advertises its Jeju grown ingredients, and in fact that's the only brand I purchased in my time there. I'll try to keep up the recaps to this season to hopefully glean a few more tidbits, and then will check out the earlier ones! Yes, I completely agree with the wastefulness in terms of throwing things out so quickly! And to think that they have tons of products - I'm sure most of them aren't even half-used before it gets thrown out. I think it's a good tip from Honey - using those stuff on your body instead. There have been several awful facial creams which I have turned into body moisturizers over the years and those turned out fine on my body! I agree they shouldn't be separated. Good skincare is the foundation for makeup anyway. I mean without good skin/skincare regime, you can slap on as much stuff on you want on your face but it won't make you look much better in the long run. Actually makeup makes skin deteriorate overtime, so all the more we need better skincare. Yes! Omg, I have had such awful experiences with Korean brands. And so have some of my friends. Tony Moly's primer caused me massive breakouts (which I haven't had since I was 18). Same with Laniege's BB cream. And even Innisfree isn't from these stuff. I had massive breakouts when i Started using their primer and green tea facial cream. It was so bad and so red (imagine a patch of pimples just appearing on the apples of your cheeks that oozed white pus when you touch them too much) I couldn't put anything on my face for 2 weeks. Etude House is just cheap nasty chemical-laden stuff. I know alot people love Korean cosmetics cause they are cheap and comes in a variety of stuff and always has new products etc. But the reason they are so cheap is cause of how much chemicals are in them imo. I'll be watching some episodes myself but am really looking forward to your recaps! As well as any other recaps of dramas that might have caught your interest! :) I miss your recaps alot! !